Continuing on our search for staple restaurants in our new town, the next box to check was Mexican! Todd and I had our first date at a Mexican restaurant. Six years later we brought our families to that same restaurant for our rehearsal dinner the night before the wedding. We have a few favorite places in Tallahassee (La Fiesta, El Jalisco, Morelia) and several places we’ll not step foot in again. We take our enjoyment of Mexican food seriously, is what I’m trying to say. Old Mexico is located downtown, on NorthÂ Broad Street, so is walkable when the weather is nice. It was sweltering when we visited back in June, so we drove to avoid harshing the promise of a Margarita with heat stroke! It’s a bit dim inside of Old Mexico, and like a lot of large, boxy spaces the noise level can get pretty high, but that’s not something that bothers us in general. They put their drinks on the front/cover of the menu–a fact I had not figured out when I was trying to figure out what types of Margaritas they had. Instead, I just ordered my usual: on the rocks, with salt, large! Now, when I said large I suppose I was expecting a double. Something along the mug size that other places have. 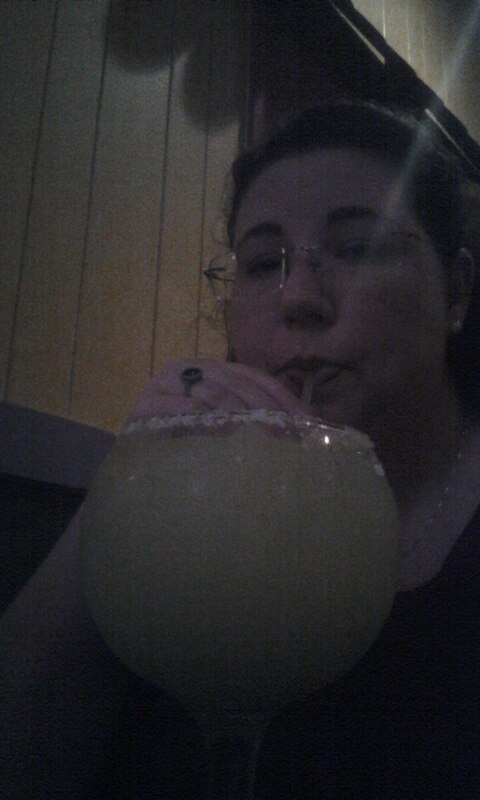 Old Mexico’s large Margarita is the size of my head and not watered down like a lot of the fishbowl drinks you get at happy hour specials in Tallahassee. Pardon the low-lit grainy shot: combo of dim restaurant and my previous phone’s habit of adding extra shadow to front-facing pics! I’m sad to say that I couldn’t get anywhere close to finishing it, but I gave it a good, Dollhouse try! Todd’s regular-sized strawberry daiquiri was large enough on its own, so I’ll still with that size unless I know I’m gonna be there a while! I am a big fan of chiles rellenos and it’s sort of my litmus test at any new Mexican place I try. I was a bit surprised that they were round, but they tasted amazing (and, no, it wasn’t the Margarita tasting for me). (Yes, there was the usual flour breading on them, I ate some of it–again, knowing my personal FODMAP limits helps me work around these sorts of situations–but also left some of the breading behind. It was worth it.) 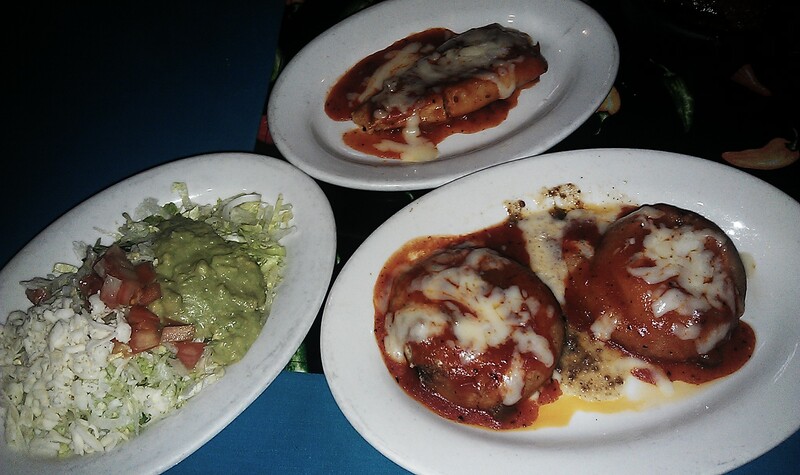 We’d also ordered a tamale–another good indicator of overall quality–and it was just as amazing as the rellenos. Todd was just as enamored of his meal (burrito platter that he’d already tucked into before I got a picture), so I think we’ll definitely be going back. After all, he didn’t get a chance to try their flan, yet! 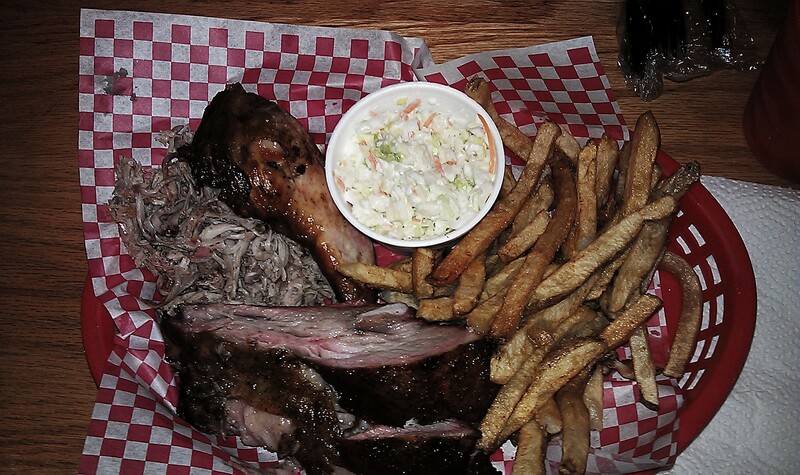 A few weeks later we were pondering our options and decided to try out the local bbq scene. Now, in Tallahassee, local chain Sonny’s is nice and reliable and they do have a location in Thomasville, so we could have always gone there. But where’s the fun in that?! 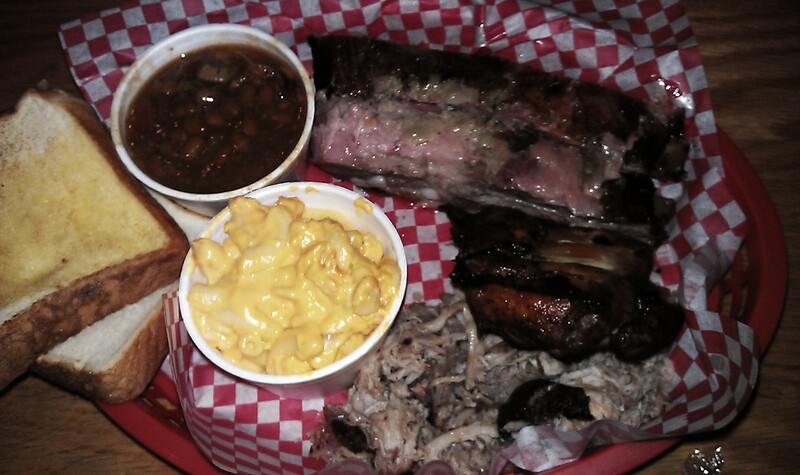 Instead, we tried a place some of Todd’s coworkers liked, Granddaddy’s Barbeque. It’s rather informal inside: you order at the counter and they call your name when you’re order is ready for pick-up. One thing that puzzled us about their menu was that you could get the trio combo of chicken, ribs, and pork for less than the Pick 2 combo… Not really much deliberation went on after seeing that, as we both got the trio to get the best idea of what this place was all about. Indulgence in the name of research. Honest. For sides (ahem, “trimmins”) Todd ordered the Brunswick Stew and the Mac & Cheese, while I got the coleslaw and fries. The one thing this place was missing was wet-naps on the self-serve station or the tables: this is messy eating! And you’ll smell like smoke (meat smoke, not cigarette smoke–even if Georgia does still allow smoking sections in their restaurants) when you leave. But these are not necessarily bad things. The ribs are fall-off-the-bone tender, if a little fatty on our visit. The chicken was surprisingly moist, and the pulled pork was tasty, though not my favorite of the three. Todd was a fan of the Brunswick Stew but said the Mac & Cheese tasted like your typical Velveeta mix, nothing special there. I have a feeling we might order their Family Pack or Plantation Platter for the next gaming night as it seems about right for sharing with fellow carnivores. For our next visit I’ll scale back my order to maybe their loaded nachos with chicken or pork, and there’s still the smoked turkey and brisket to try. Of course, there’s more than one local bbq place in town, so who knows, Granddaddy’s might have some competition for our favorite. That remains to be seen! Next time on Tasting Thomasville: frozen treats and a Greek-Southern fusion that really hits the spot (and tugs on the heartstrings). 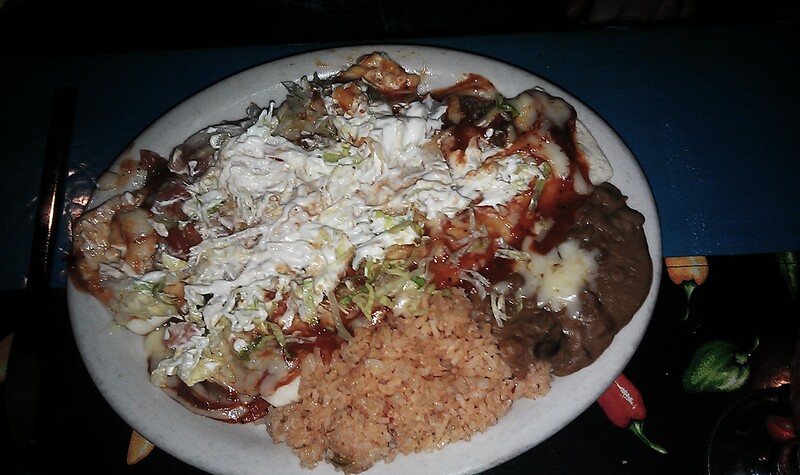 I love, love, love Mexican food — to the point where I actually have to stop and think, “Really? You want Mexican AGAIN?” Sounds like you’ve found a winner, you’ve definitely got my tastebuds planning a fiesta for dinner tonight! Oh, how I want a margarita now! I’m jealous of anyone who has good Mexican food nearby! Announcing the Relaunch of Random Acts Radio!